As 2019 begins, the ocean tech community celebrates 50 velopments was the MIT Sea Grant Autonomous Underwa- years of Oceanology International, a global gathering and ter Vehicle (AUV) Lab which spawned numerous vehicles, showcase of the tools and technologies used by maritime in- launched an industry leader, and trained many engineers now dustry, science, and defense. In that retrospective spirit it is shaping the ? eld around the world. 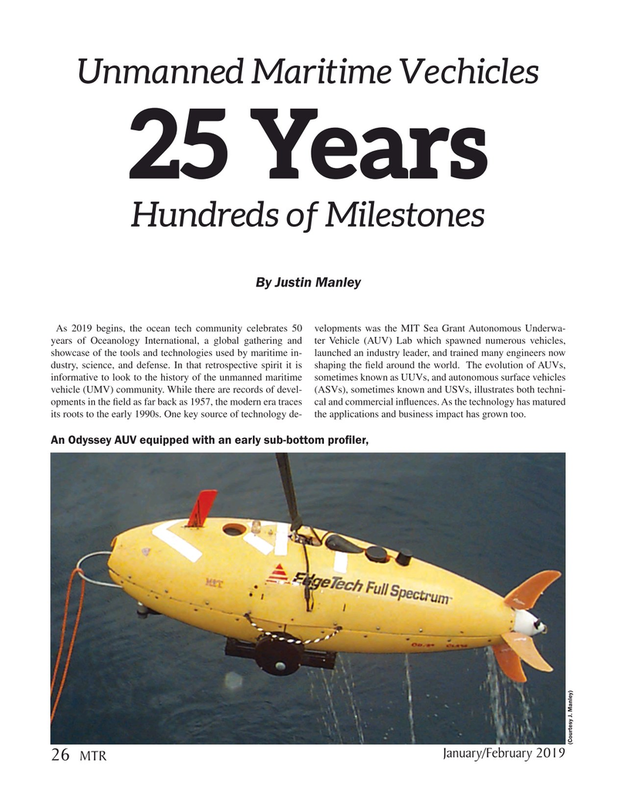 The evolution of AUVs, informative to look to the history of the unmanned maritime sometimes known as UUVs, and autonomous surface vehicles vehicle (UMV) community. While there are records of devel- (ASVs), sometimes known and USVs, illustrates both techni- opments in the ? eld as far back as 1957, the modern era traces cal and commercial in? uences. As the technology has matured its roots to the early 1990s. One key source of technology de- the applications and business impact has grown too.